Eat it or Store it? This baked ziti (ziti al forno) recipe is a delicious way to cook and enjoy pasta. Begin by making the marinara sauce: In a large sauce pan, heat the olive oil over medium heat and add the chopped onion. Cook until the onion is translucent then add the garlic to the pan. Cook for a minute then add the ground beef and ground sausage. Stir the meat and break it up into small pieces using your spoon or spatula. In a medium bowl, combine the ricotta, heavy cream, Parmigiano-Reggiano and grated mozzarella. Place about 1/4 cup of the marinara in the bottom of a 9x13 casserole dish. Place 1/3 of the cooked ziti in the dish and top with 1/3 of the sauce and 1/3 of the cheese mix. Repeat this layering process until all of the ingredients are layered into the casserole pan. Top the ziti with the remaining mozzarella slices and sprinkle with extra Parmigiano-Reggiano. Bake in a 450 degree F oven for about 30 to 40 minutes or until the cheese on top is melted and browning and the sauce around the edge of the pan is bubbling. Enjoy immediately or freeze! Pasta and sauce is great, but do you know what is even better? Pasta and sauce baked together with cheese, meats and other seasonings. How can you resist that?! 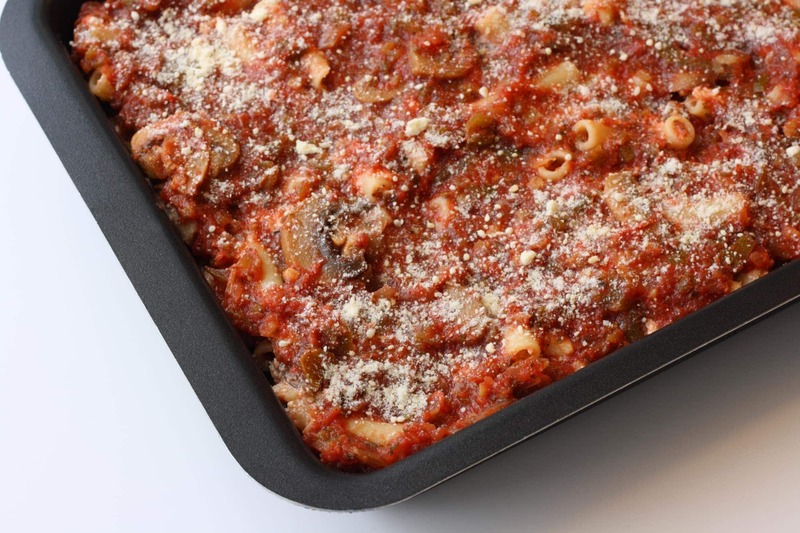 Casserole dishes are a great way to serve pasta and a popular version is baked ziti. It’s time to take a closer look at the authentic Italian baked ziti and learn where it comes from, how to make it and what makes it so delicious. Baked pasta has been around almost as long as pasta itself with the first baked pasta dishes tracking back to the middle ages. The idea began when chefs strived to create a full meal in one dish- a pasta, a protein, dairy and a vegetable all together. Creativity was also necessary and a chef could show their capabilities by creating delicious and unique baked pastas. Pasta al Forno (literally translated to ‘oven pasta’) became popular all throughout Italy with each region creating their own versions. Baked pastas in Northern Italy tend to favor hearty ingredients like meaty marinaras and fatty cheeses. Southern Italian pasta dishes have more veggies and lighter sauces. Baked ziti resembles a baked pasta from Northern Italy, but it’s actually original to the Naples area. The meat sauce along with the cheese makes for a hearty dish that is perfect for colder weather. As mentioned previously, baked pastas were a way for chefs to use ingredients they had on hand to make one complete meal. Baked ziti has now become more of an established recipe rather than a collection of random ingredients. Italian-Americans are to thank for developing baked ziti into a standard dish that is still extremely popular. With pasta, sauce, meat and cheese, this recipe is still a complete meal in one dish! Baked ziti is, of course, made with ziti pasta. 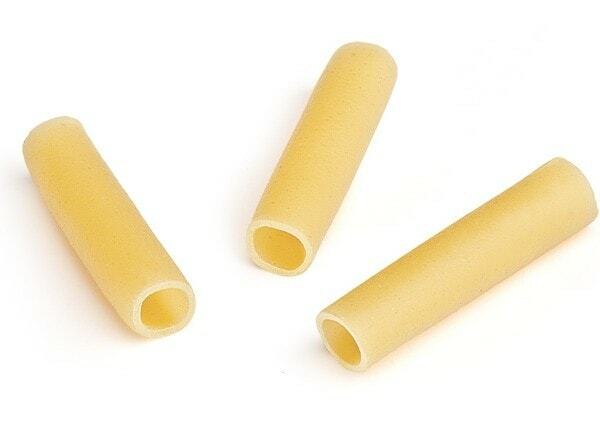 Ziti is a medium, tube shaped pasta without ribs on the outside of the noodle. A lot of people use rigatoni pasta in their baked ziti recipes, rigatoni is very similar to ziti, the only difference is that rigatoni has ribs on the outside of the noodle. 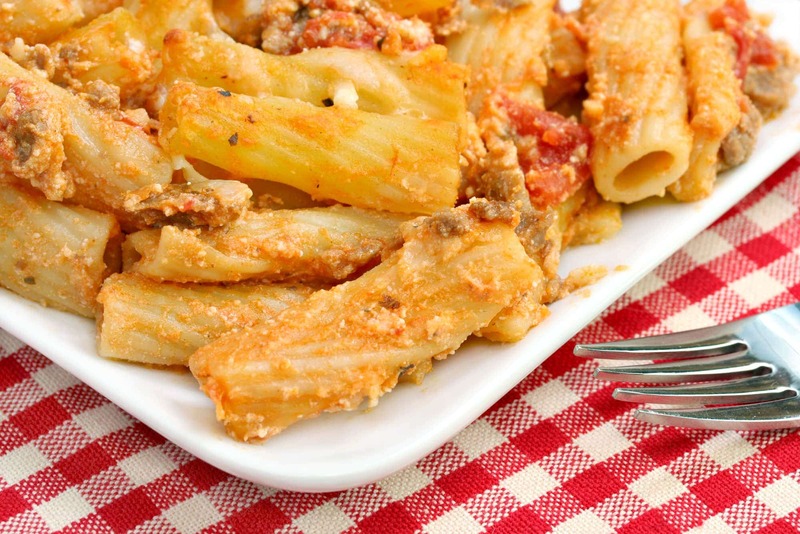 If you are unable to find ziti, penne or rigatoni are good substitute for baked pasta dishes. When comparing ziti to penne you will notice that ziti is larger than penne and has straight cut edges rather than diagonally cut ends. 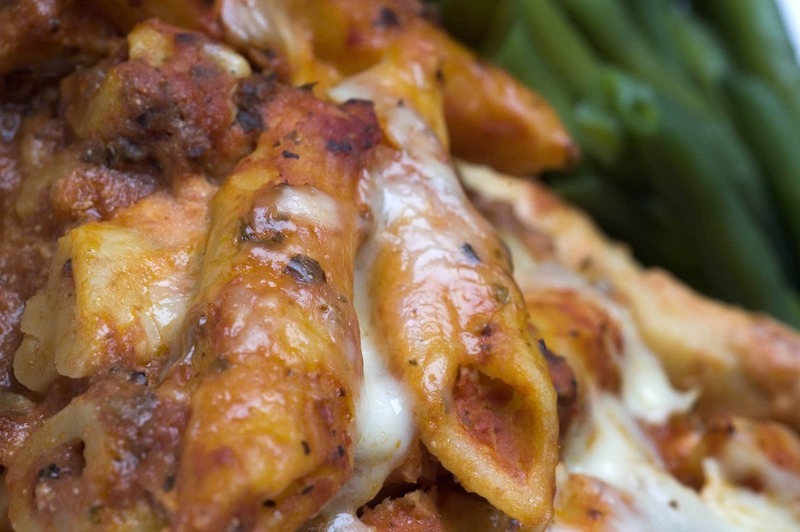 Ziti are better in baked pasta dishes while penne are great with a simple Italian sauce. Check out our comprehensive list of types of pasta and sauces. A good, homemade marinara sauce is the best ingredient for this recipe. Using high quality ingredients like fresh garlic and onions, tomatoes and basil will enhance your ziti. If you do not have time to whip up a sauce, find a good ready made sauce and jazz it up with some herbs and spices. Baked ziti is usually made with ground meat sauce. Ground beef and ground sausage are the two most used meats for the recipe, usually combined for more flavor. Occasionally the dish is made with whole slices of cooked sausage rather than ground but that is up to your taste. Baked ziti are also a vegetarian dish if you just add vegetables to the sauce such as peppers, mushrooms or broccoli. You can create many variations – make your own! A very important and crucial part of baked ziti is the cheese. There are three types of cheese for this dish. Parmigiano, mozzarella and ricotta are part of the authentic ziti recipe. Grate Parmigiano cheese and mozzarella and mix them together with ricotta. The cheeses are baked into the ziti and also melted on top of the dish for an irresistible cheesy topping. You now know all the ingredients to make an authentic Italian baked ziti, so how to put the dish together? Once the pasta and the sauce are ready, making the dish is all about layering. Spread a tiny layer of sauce across the bottom of a casserole dish followed by a layer of cooked ziti. Lay more marinara on top of the pasta followed by the mozzarella, ricotta, parmigiano mix. Add another layer of pasta, another layer of sauce and another layer of cheese. Putting baked ziti together is very similar to create a lasagna or any baked pasta dish. The casserole bakes until the cheese on top is bubbling and the baked ziti is nice and hot throughout the tray. The pasta and the meat are fully cooked before, so just bake until the cheese melts and the sauce is bubbling around the edges. This dish is ready to eat right out of the oven (better to wait a minute so the cheese doesn’t burn your mouth!). It is also a great dish to freeze for a later date. Wrap the casserole tightly and store in the freezer for up to 3 months. Simply defrost the casserole and reheat it in the oven anytime you are ready to eat! Homemade baked ziti topped with parmigiano cheese. 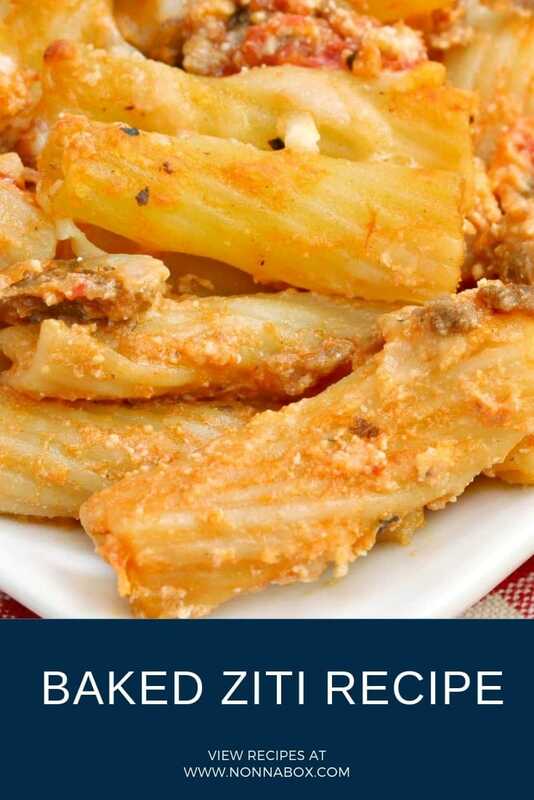 Now you are ready to cook this easy ziti al forno recipe and serve a perfect, authentic Italian dish. Follow the recipe or add vegetables to create your own baked ziti variations.